I love shooting in Downtown Los Angeles, there is a huge selection of areas to shoot and an abundance of textures that in just a short area allows you to get a number of different shots that all look unique. 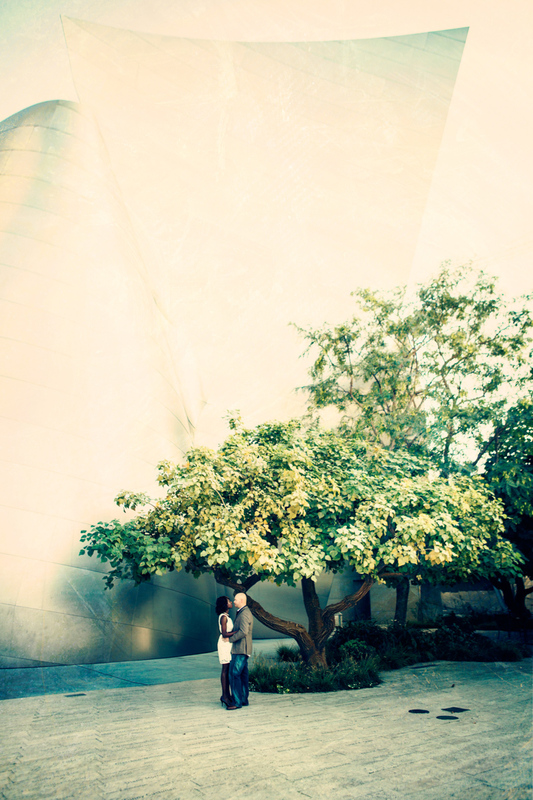 Engagement photography sessions at the Walt Disney Hall always have something special about them. Maybe it's part the magic of Disney but more than likely it is just the amazing curves of this building that Gehry designed. The titanium walls while they are brushed reflect the colors around them and bring a texture through that looks wonderful. When getting into some the spaces the shapes look incredibly abstract and allow a lot of creativity. I recently did a Los Angeles engagement photography shoot with Mitch and his wife. They are already married but they had a quickly planned wedding and never got engagement photos. They were flying into Los Angeles for the weekend and contacted me for some ideas on shooting a makeup engagement session. 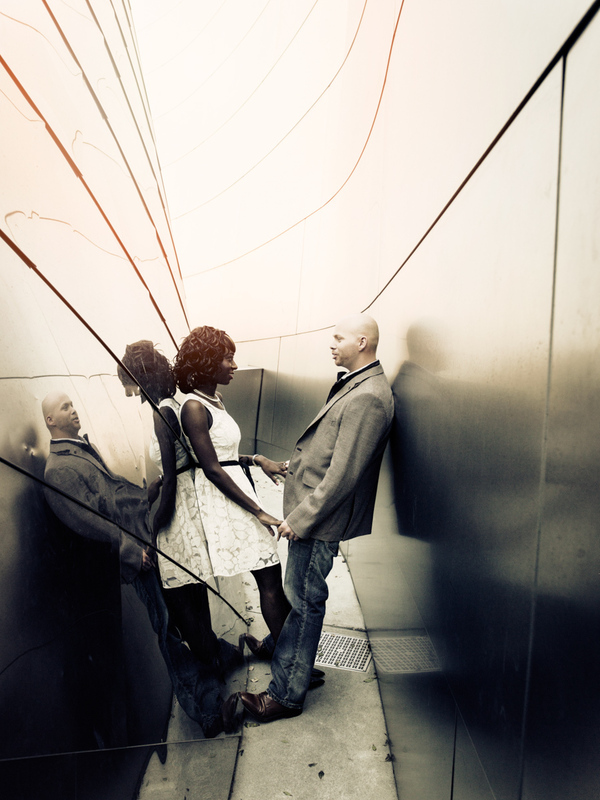 We chose to do this engagement photography in downtown Los Angeles because of the time of year. There was an earlier sunset than usual, it was a weekend so we didn't have to worry about traffic and they were staying at The Standard just a couple blocks away. The shots below are some of my personal favorites. When we shoot engagement photography sessions we always look for opportunities to give our clients something that they can make big art pieces out of, or images that can span two full pages in an album or maybe look great as a wide panoramic print. We don't want to just give our clients pictures and have that be it. I love shooting my clients, helping them pick out artwork for their homes and then later getting the contact from them about how beautiful the pieces are. Take a look below at the Los Angeles engagement photography session we did for them and contact us today about what we can do for you.